Annapurna Seed Library’s display at Kaziranga National Orchid and Biodiversity Park. Photo by Bijit Dutta / Annapurna Seed Library. In the foothills of the eastern Himalayas in Assam, Mahan Chandra Borah, is racing against time to stock up nearly-extinct and rare indigenous rice varieties, one grain at a time, in his unique seed library-to help secure genetic diversity for climate resilience. Borah’s ‘Annapurna’ library is “northeast India’s first indigenous seed saving library” that seeks to collect and promote the cultivation of heirloom rice landraces of the region in the wake of climate change. 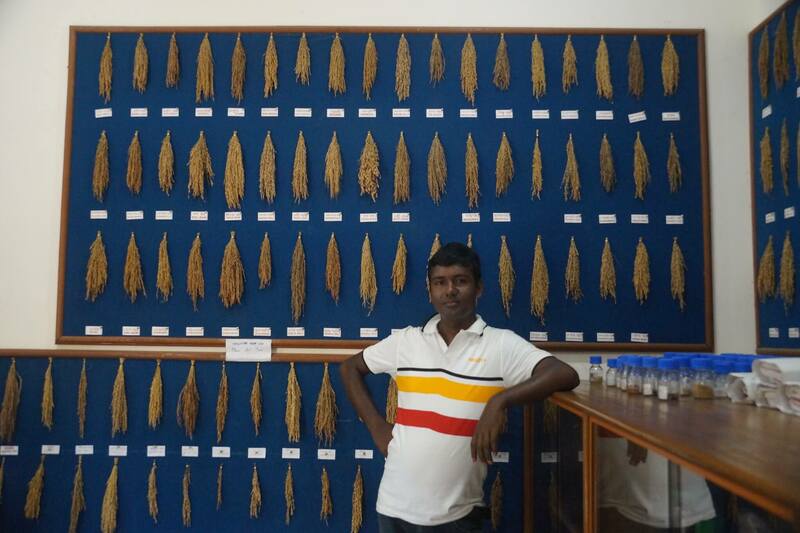 A history graduate-turned-farmer, he started the seed bank about 12 years ago, from Meleng in Assam. Backed by traditional wisdom on diverse rice cultivars imparted by the elderly in his village, he fanned out to hamlets across the northeastern states in hunt of these treasures. He subsequently converted it into a library. His assemblage includes aromatic, sticky, black, flood-tolerant and hill rice among others. Annapurna is also a sister library of the California-based Richmond Grows Seed Lending Library. Richmond Grows in its website says the idea is that you “plant the seeds, let some go to seed, then return some of these next generation seeds for others to borrow.” So, people from the region can borrow seeds from Borah’s library, conserve it and lend the seeds to others. Borah has expanded his endeavour to open up libraries in other parts of the state in Sadiya, Balipara and Kaziranga. “Farmers come to me to deposit seeds. I sow them in a plot of land and then later on, others come and borrow the resulting seeds. It is not a strict rule that they have to give me back some seeds in return. They can carry on the chain. I characterise their properties and educate the farmers as well so they can make an informed choice about the rice variety they want to procure,” he explained. According to Ministry of Agriculture’s agricultural statistics for 2015-16, India produced 104.31 million tonnes of rice over 43.38 million hectares. Rice is the most significant crop cultivated in northeast India. Rice is cultivated in a wide range of agro-ecological situations in Assam: from the hill slopes of Karbi Anglong to drought-affected upland and rain-fed lowland to very deep water conditions. There are four broad divisions of rice cultivars grown in Assam – Sali (winter rice), Ahu (autumn), Boro (summer) and Bao (deepwater rice), having various traits such as stickiness, high starch content, waxy or otherwise and aromatic. It is because of this exposure to a range of environmental conditions, there is extensive diversity in traditional landraces. Borah conducts regular workshops for university students educating them about the diversity and the need to preserve the indigenous varieties and plans to connect with more to spur a community seed library initiative. Mahan Borah’s rice seed lending library exhibition. Photo by Sahana Ghosh / Mongabay. At the Biodiverse 2018 conference at IIT-Guwahati, Borah showcased a clutch of rice types for attending students and participants. Take ‘Tulsi Sali’, for example. It is suitable for low land areas. Borah points out it takes time to cook but “is good for hardworking people”, alluding to its nutritional characteristics. Also, on display was the iconic ‘Joha’ aromatic variety that received the geographical indication (GI) tag last year, as well as stocks of exquisite black rice. “Burma Black (black rice) needs two whistles (on a pressure cooker). Kokua Bora’s grains are red and is very tasty as a parboiled rice,” Borah said. “Some of the Joha rice varieties are at the cusp of extinction while other such as Dumai, Murali in Barak Valley are also threatened,” added T. Ahmed, chief scientist, Regional Agricultural Research Station, Titabar, under Assam Agricultural University (AAU). Rice germplasm of the region should be thoroughly evaluated to seek out sources of resistance before they are wiped out by ravages of nature and human interventions, he emphasized. “Despite their low-yield potential, these cultivars are grown for their high market and social values. And they are important reservoirs of valuable traits. The germplasm collections from this region could serve as valuable resources in breeding for abiotic stress tolerance, grain yield and cooking/eating quality,” Ahmed said. Rice seed labelled according to their traits. Photo by Sahana Ghosh / Mongabay. Climatic factors have also pushed scientists to harness biotechnological tools to develop resilient rice varieties. “We are developing short-duration flood tolerant variety. We developed the popular Ranjit variety which is suited to flood-free rain-fed lowlands during winter season in Assam. It now covers over 60 percent of sali (winter) crop areas. The improved ‘Keteki Joha’ scented rice gives three times higher yield. We need a basketful of rice varieties to combat climate change and develop resilience. Any form of conservation, whether ex-situ (in lab) or in-situ (natural site) is good,” Ahmed said. Mahan Borah’s rice seed collection displayed in a village. Photo by Bijit Dutta / Annapurna Seed Library. According to Assam’s Action Plan on Climate Change (SAPCC 2015-2020) the state falls within areas of greatest climate sensitivity, maximum vulnerability and lowest adaptive capacity. The draft report has flagged rise in ambient temperature, reduction in availability of water for irrigation, degrading soil health, erratic floods and droughts, emergence of new pests and pathogens as “threats” to rice production levels. The emerging trends of rainfall indicate a reduction in the number of rainy days but a spike in extreme rainfall days coupled with enhanced intensity. Total rainfall is projected to increase in most of the areas in the Assam in the future. “Nearly 0.4 million hectares of paddy is chronically flood prone and in some years, the flood swallows up about 1 million hectares,” Ahmed said. In addition, the hot humid climate of Assam favours pests and diseases. The pest scenario is further aggravated by intensive cultivation of susceptible modern HYVs, overlapping growing seasons, use of high doses of chemical fertilisers and injudicious use of plant protection chemicals. “Wild rice types are disappearing very fast and collection of wild rice deserves priority. Biotechnological tools will be helpful in conserving rice varieties. Also, variability of germplasm up to DNA level should be documented with regards to IPR regime,” Ahmed said. “Northeast is the motherland of paddy. My ancestors were into farming and I took up the profession. Gradually it was seen that some of the traditional varieties started vanishing. This is not good. In addition, the seed market is being monopolised. So if you think about food security, you must think about seed security,” Borah signed-off. This article was originally published at Mongabay India. It has been re-published at IC under a Creative Commons License.